First page of issue #10! Okay, so I’ve not posted much lately which, as per usual, means I got a bit caught up in my work and forgot to post here! I’m currently colouring issue #10 of Lloyd and the Bear which will be available later this month! Yup, I’m confident with that comment which means I’m back on track and (hopefully) out of deadline doom! Yay! Anyways, here’s the first page of the new book! 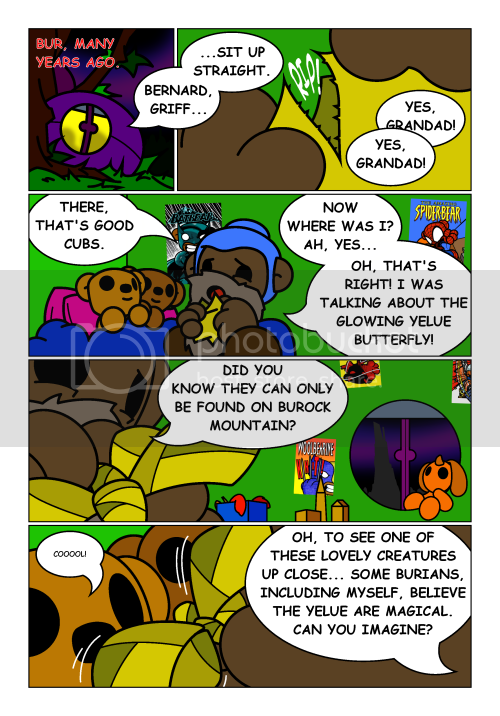 I previously posted that this issue will be about Bear and his time on Bur when he was younger and just look how cute young Bear is!!!!! Oh, and check it! Griff is back! We’ve not seen Bear’s brother since issue #1 and even that was for only a few panels! Yup, in this issue you’ll get to know him a bit better. Well, you’ll get to know young Griff (and in turn, young Bear) a bit better. Curious? Cool.